The daily time frame triggered a bullish slingshot. I gotta get going. I will be away from the computer for the rest of the day. I decided to close the rest of my long at 12115. I'm expecting a price action similar to the January of 2015. Higher long is closed at 12139.5. 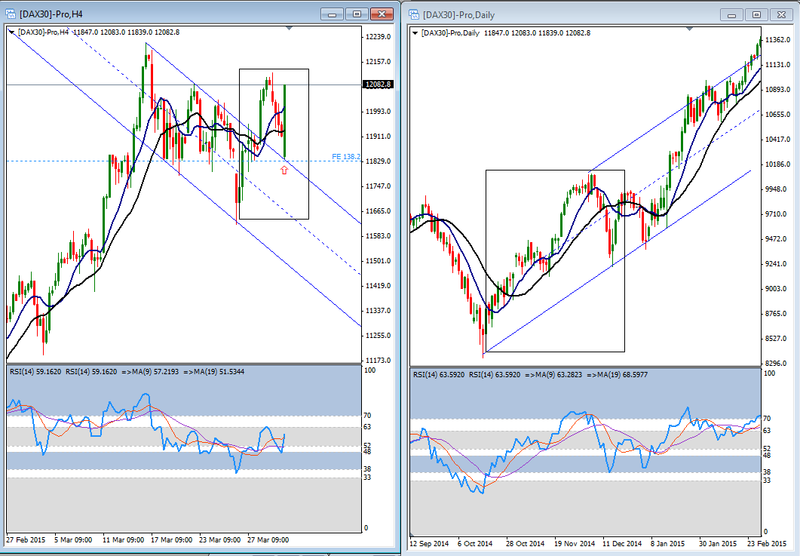 I opened another long and I'm hoping that the dax will reach higher prices today. I'm expecting a tricky movement though, which I might have posted already last week about the similarity of the recent price action with the first weeks of january 2015. The higher long is closed at 12106.5. 2R in the pocket. It looks like it was a good decision to lower my Sl back a little bit and to open another long. We'll see how this is going to work out because we are near to a resistance. Raised my SL to 12065.5. 15 minutes chart offers a bullish slingshot opportunity. I opened a long position. The triangle pattern looks like it's gonna fail, at least it has a slight chance. The price action might get tricky again, but I try to hop on this inverse h&s pattern opportunity (not valid yet) and open a long position. My shorts got stop out at entry points. This is what I pay close attention on the 4 hours chart. 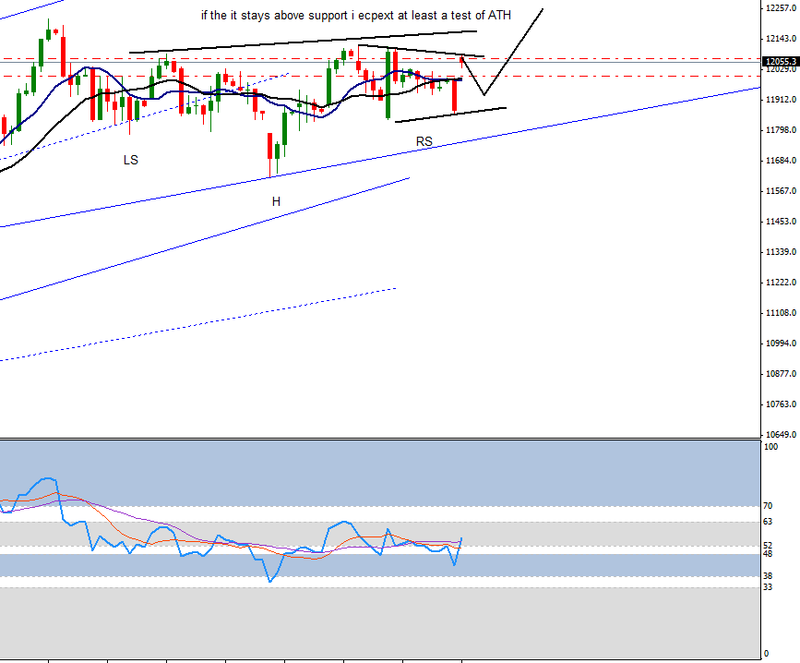 h4 chart. Inverse h&s pattern is not valid yet. This is the short setup I'm trying to play out. I just missed the scale out level, so now I'm just trying to sit on my hands. I'm still thinking this is part of a correction on the 1 and 4 hours chart (most likely a wave [e] of triangle) and after the patterm is done, I anticipate a break out attempt to reach ATH again. On the 1 hour chart this upside movement might be part of a triangle. Last Friday's price action got even trickier then I expected. I'm looking for a gap filling for today.